Jun 27, 2017 - Sanofi/Regene ron. 2015. Human. IgG1. Heterozygous familial h ypercholesterolemia. s.c.. Nonlinear. â. TMDD. PCSK9. Basiliximab. Simulect. Dec 5, 2012 - Zahir, H., Keogh, A. & Akhlaghi, F. Apparent clearance of sirolimus in heart transplant recipi- ents: impact of primary diagnosis and serum lipids. Dec 27, 2017 - key features of lung and systemic PK after pulmonary administration of a set of 12 .... pulmonary PK, for all investigated bases and quaternary. Dec 1, 2012 - Chapter 5: Network Biology Approach to Complex Diseases ... We start this chapter with ...... Answers to the exercises are provided in. Text S1. Dec 3, 2010 - Downloaded By: [Inst of Geographical Sciences & Natural Resources .... grid dataset; WEKA (Witten and Frank 2005) and Netica API (Norsys 2009) to conduct data ...... Using kernel density functions as an urban analysis tool:. We have various kinds of networks around us ranging from computer networks to ... and how biological networks help in the development of future medicines. Apr 2, 2005 - inductive analytical models are simply not adequate hosts for the specific new ..... Telecommunications Software Systems, (Amsterdam, The. context of an email message in order to steal confidential information from a user by .... good practice in that it does not use technology to carry out business. derived from biophysical properties. This may underlie one of the difficulties in extrapolating model parameters across different cell lines. It is also important to recognize the distinct time scales at play. Dynamic events triggered by cell surface receptor engagement reach (quasi)-steady state within minutes to a few hours, while phenotypic readouts (i.e., measurable changes in bulk tumor size) are typically quantified on the order of days to weeks. As a consequence, many molecular events may be represented algebraically rather than with more arduous differential equations. Another practical consideration is the type of data available for model training. Biochemical measurements are typically semi-quantitative, lacking the precision (molecules/cell) and the coverage (measured vs. inferred species) required to parameterize massaction kinetic-based models. Quantitative logic provides an alternative and relatively simple formalism to represent the structure and information processing capabilities of signaling networks,21,22 bridging the distinct time scales of biochemical and physiological events. Quantitative logic networks are assembled using Hill-type equations, malleable signalresponse curves representing information flow between nodes (i.e., protein species). When a network node contains multiple inputs, quantitative logic gates can be used to represent various types of signal processing.23 These are analogue extensions of Boolean logic truth tables, the most common forms being AND, NAND, OR, and NOR gates, which can be configured to recapitulate biochemical and pharmacological mechanisms. The algebraic equations can be easily extended into differential equation form, so as to capture both fast (steady state) and slower (dynamic) process together, using systems of differential-algebraic equations (Figure 1). The logic gates and hill functions used to describe signal flow in quantitative logic networks are data-driven rather than based upon fundamental biophysical constants. However, they are in fact not as different from mass action kinetic ordinary differential equations as initial appearances suggest, given that such models often contain many data-driven parameters as well. Note there is no single best approach to modeling cell signal transduction. The choice between alternatives, from purely data-driven statistical models to physiochemical ODEs, should be determined by the specific questions at hand, data available, and specifics of the underlying biology. The next challenge is specifying the level of detail required to describe the relevant biology and mechanistically capture exposure-response relationships. Explicitly characterizing all biochemical reactions taking place in a cell (“bottom-up” network reconstruction) is currently impractical given the complexity and remaining knowledge gaps involved in cellular signal transduction.20 Can we then identify archetypal properties of signaling networks necessary to be included in our models, striking a balance between predictive power and mechanistic representation of the biology? Below we describe four systems-level design features as hallmarks of oncogenic signaling networks: modularity, redundancy, adaptation, and heterogeneity. We will outline how these features can be captured mathematically, and the implications for drug development. While our focus is oncology, we believe the principles and approaches described are generalizable to other areas. Figure 1 Mathematical underpinnings of quantitative logic networks. (a) Hill-type equations can be used to describe input–output relationships between individual nodes (i.e., proteins) in a network. Using two parameters, the Hill coefficient (K) and EC50 value (τ), these malleable equations are capable of describing a wide range of stimulatory and inhibitory response curves. (b) Hill-type equations can be modified to capture dynamic as well as algebraic (steady state) relationships. Shown are exemplary time course phase portraits of an output variable (Y) in response to a pulse of stimulator (X), indicated by dashed lines. The system gain (GY) and symmetric rates of production/degradation (rY) can be tuned to capture differing system dynamics, while the basal set-point of Y (YB) quantifies the steady-state level. (c) Various types of quantitative logic gates can be used to capture biologically relevant responses to dual inputs. Shown are four exemplary surface responses: dual stimulatory OR gate (i.e., alternative RTKs activating PI3K, with different relative activation weights (w)), dual stimulatory AND gate (i.e., co-dependent transcription factors activating gene expression), competitive inhibition (i.e., stimulatory ligand vs. ligand-blocking antibody), and non-competitive inhibition (i.e., a stimulatory ligand vs. small molecule RTK inhibitor). PI3K, phosphatidylinositide 3-kinase. becoming increasingly appreciated in oncology through the phenomena of “pathway switching.” Tumors displaying oncogene addiction to a single RTK driver are often capable of switching dependency to an alternate, but functionally equivalent RTK following inhibitor treatment.31 The core cytosolic cascades themselves also display a degree of horizontal redundancy. For example, in a variety of preclinical cancer models it has been demonstrated that complete suppression of either PI3K or MAPK pathways alone results in at best tumor growth suppression (or stasis), while cotargeting both cascades is required to induce apoptosis and tumor regression.32 This phenomenon can be described mathematically using logical OR gates along the signal transmission route from surface receptors to phenotypic readouts (i.e., AKT can be activated by EGFR or ERBB3 receptors, apoptosis is inhibited by active AKT or ERK signals). 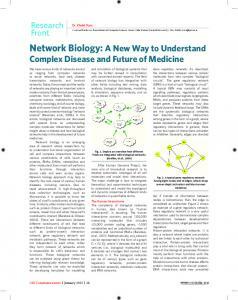 the notion of pathways as functional network ­modules—clusters of nodes (proteins) which are highly interconnected but less connected to other parts of the network, and mapped to highly overlapping phenotypes.24 This concept is perhaps best supported by data emerging from cancer genome sequencing projects. Even within clinically homogenous diseases, mutations between tumors are found to be incredibly disparate. However, when mutations are mapped onto protein interaction networks, they fall onto a relatively conserved set of oncogenic modules. Most notable are the phosphatidylinositide 3-kinase (PI3K)/AKT and mitogen-activated protein kinase/extracellular signal-regulated kinase (MAPK/ ERK) cascades, and the receptor tyrosine kinases (RTKs) which regulate their activities, the TP53 and cell-cycle control modules, the apoptotic caspase machinery, as well as a handful of other more indication and tissue-specific signaling cascades.25–27 Moreover, mutations within these network modules are generally found to be mutually exclusive (the prototypic example being PI3KCA-activating mutations vs. PTEN deletions), indicating that what “matters” to the cell is the activation of modules rather than individual molecules. The implication is that mathematical representations of molecular networks can be condensed to more abstract, modular formats, while maintaining functional relevance. This can be achieved using rigorous bioinformatic28 or graph theoretical approaches,29 or heuristically (as is common practice) by selecting key sentinel nodes representative of modules activation states (i.e., phosphorylated AKT and ERK for the PI3K and MAPK cascades, respectively). This reduction vastly simplifies the computational requirements for parameterizing sparsely sampled and underdetermined systems. However, if the module decomposition scheme is appropriate, functional inferences from such granular descriptions should be equivalent to more detailed molecular forms. Figure 2 Adaptive feedback circuits based on control theory. Slight modification of the equation presented in Figure 1b can be used to describe the activation of node (Y) by one of its downstream dependents (X), forming a negative feedback control circuit. Two alternative configurations are depicted, each displaying similar response dynamics to targeted inhibition (I) of X – up-regulation of Y to a new steady-state value. For exemplary purposes, the inhibitor (I) is constant in these simulations, but a pharmacokinetic driving model could be incorporated to account for more complex in vivo pharmacodynamics. Tumor growth response heterogeneity vs.
one can then quantify the sensitivity of each clone to drug treatment using metrics such as percentage tumor growth inhibition. Such synthetic multivariate datasets can then be used to extract statistical relationships between biochemical variability and drug responsiveness (Figure 3). Given the semi-empirical nature of quantitative logic networks, parameter variations reflect relative changes from a prototypic cell type used for model training. Mutations can be represented by their functional effects. For example, gene amplification (or other means of increased protein expression) can be captured by simply increasing the relative basal level of a node, and conversely for gene knockouts. Activating kinase mutations can be captured by decreasing the EC50 value in upstream activating connections and thus simulating hyperactivity, conversely for deactivating mutations. While their parametric changes may be viewed as crude representations of molecular biochemistry, their relative effects on networklevel responses to drug treatment may still be informative. Variations on pieces of this approach have been employed elsewhere. Population pharmacokinetic modeling is widely used to understand how interindividual variability in drug metabolism and physiology affects drug exposure and clinical responses.43 Tumor dynamic models have been used to predict overall survival based on the variability in initial tumor growth responses to drug treatment.44,45 At the cellular level, simulations of molecular variation have been used to recapitulate phenotypic heterogeneity in cell populations.46 Signaling networks provide a means to link these different classes of models, connecting drug exposure, through molecular activities, to clinically relevant responses. This could enable the identification of mechanistic, rather than statisticallybased clinical biomarkers for patient stratification. Figure 3 Heterogeneity in tumor growth and drug responsiveness described using Monte Carlo simulations. Tumor growth models (in this case exponential, but other forms are possible) describe the bulk tumor burden over time as a balance between population-average cell proliferation (µ) vs. death (δ) rates. These phenotypic parameters can in turn be described as functions of cell signaling states. 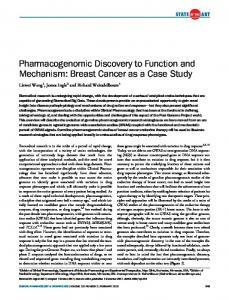 By randomly varying model parameters describing signal flow through the network (i.e., protein levels, biochemical kinetics, and gene mutations) and performing repeated Monte Carlo simulations, it is possible to create synthetically heterogeneous tumor “clones.” Following in silico treatment of tumor populations with drugs or drug combinations, statistical analyses can extract mechanistic biomarkers predictive of drug sensitivity and resistance. Figure 4 Example representation of a generalized cancer cell signaling network. We have recently used a variation of this generalized network model for in silico combination drug screening in ERBB2-amplified breast cancer.49 Three receptor tyrosine kinases (RTKs; in our specific case three ERBB-family receptors) are activated in ligand-dependent or independent manner. Active (phosphorylated forms) of the receptors initiate the canonical PI3K/ AKT and MAPK/ERK cascades, though with different characteristic biases, captured using multi-input OR gates. Active (phospho-) AKT and ERK in turn inhibit RTK expression via negative feedback regulatory circuits (red lines). Phospho-AKT and ERK were identified as driving cell proliferation and inhibiting cell death via logical OR and AND gates respectively. Measurable tumor cell growth then represents a balance between rates of cell proliferation and death. The signal transduction portion of the model (RTKs to AKT/ERK) was represented algebraically, while the RTK feedback circuits and cell-growth regulation were represented using differential equations. MAPK/ERK, mitogen-activated protein kinase/extracellular signalregulated kinase; PI3K, phosphatidylinositide 3-kinase. treatment of non-Hodgkin’s lymphoma,52 gefitinib treatment of glioblastoma.53 Whereas this approach has proven fruitful in a few select cases, incorporating cellular networks into PK-PD models is by no means a panacea to drug development challenges. Computational models are only as good as their assumptions, and assumptions which hold in one context may break down in another. First, our knowledge about the topology of intracellular signaling networks remains far from complete. Even extensively studied signal transduction cascades, when reconstructed from unbiased proteomic methods turn have orders of magnitude more interactions than depicted in canonical signaling maps.20 Determining which of these canonical and noncanonical interactions to include in a model thus remains an open problem. More vexing, network connectivity appears to be fluid, such that biochemical circuitry differs between tissues, and even in the same cell under alternate environmental conditions. This poses a particularly acute challenge for translating model predictions from cell culture, to animal models, to clinical strategies. Developing a clearer understanding of the variability in network architectures across different tissues and cancer indications will be essential to broadening the scope of mechanistic PK-PD models. Perhaps tumors can be clustered into distinct groups based on molecular wiring and pathway dependence, rather than histology or molecular profiles? This would provide a more functionally relevant guide to drug development strategies. Another limitation of the above approach is that cancer cells are modeled as autonomous units, ignoring tissue architecture, physiology, and cell–cell interactions.54,55 These processes are known to play important roles in tumor biology and pharmacology, such that multiscale models must eventually describe tumors as complex tissues involving intercellular signaling networks,56 rather than independent collections of cells. Model development is an iterative process. Successive rounds of model parameterization, verification, and modification require a close collaboration between computational scientists, experimental biologists, and clinicians. Fostering such relationships can be challenging in large organizations with established cultures and clearly defined boundaries between departments and scientific disciplines. Overcoming such cultural barriers is perhaps just as challenging as the technical issues we have discussed. Despite the remaining obstacles, we believe the stepwise introduction of mechanistic, network biology-based mathematical models will be essential for translating knowledge about molecular biology into clinical decisions. The approach described and mathematical tools presented represent our humble attempt to do so. Through the continued development and application of mechanistic model-based drug development, we hope to see a new generation of highly selective and effective drug regimens emerge to better serve the needs of patients. Acknowledgments. We thank Bart Hendricks, Charlotte ­McDonagh, Birgit Schoeberl, Ulrik Nielson, Jinyan Du, J­ ohanna Lahdenranta, Petra Loesch, as well as the r­eviewers for careful reading of the manuscript and providing helpful comments. Conflict of interest. The authors declared no conflict of ­interest. 7 1. Munos, B. Lessons from 60 years of pharmaceutical innovation. Nat. Rev. Drug Discov. 8, 959–968 (2009). 2. Scannell, J.W., Blanckley, A., Boldon, H. & Warrington, B. Diagnosing the decline in pharmaceutical R&D efficiency. Nat. Rev. Drug Discov. 11, 191–200 (2012). 3. FDA. Innovation or Stagnation: Challenge and Opportunity on the Critical Path to New Medical Products. (2004). 4. Vicini, P. Multiscale modeling in drug discovery and development: future opportunities and present challenges. Clin. Pharmacol. Ther. 88, 126–129 (2010). 5. Graaf, P.H., van der & Benson, N. Systems pharmacology: bridging systems biology and pharmacokinetics-pharmacodynamics (PKPD) in drug discovery and development. Pharm. Res. 28, 1460–1464 (2011). 6. Gutenkunst, R.N., Waterfall, J.J., Casey, F.P., Brown, K.S., Myers, C.R. & Sethna, J.P. Universally sloppy parameter sensitivities in systems biology models. PLoS Comput. Biol. 3, 1871–1878 (2007). 7. Sorger, P.K. et al. Quantitative and Systems Pharmacology in the Post-genomic Era: New Approaches to Discovering Drugs and Understanding Therapeutic Mechanisms An NIH White Paper by the QSP Workshop Group – October, 2011. NIH White paper (2011). 8. Reimand, J. & Bader, G.D. Systematic analysis of somatic mutations in phosphorylation signaling predicts novel cancer drivers. Mol. Syst. Biol. 9, 637 (2013). 9. Iyengar, R., Zhao, S., Chung, S.W., Mager, D.E. & Gallo, J.M. Merging systems biology with pharmacodynamics. Sci. Transl. Med. 4, 126ps7 (2012). 10. Mager, D.E. & Jusko, W.J. 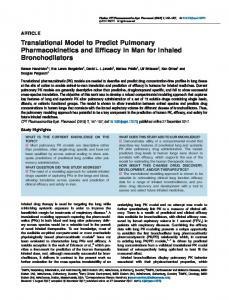 Development of translational pharmacokineticpharmacodynamic models. Clin. Pharmacol. Ther. 83, 909–912 (2008). 11. Fitzgerald, J.B., Schoeberl, B., Nielsen, U.B. & Sorger, P.K. Systems biology and combination therapy in the quest for clinical efficacy. Nat. Chem. Biol. 2, 458–466 (2006). 12. Yap, T.A., Gerlinger, M., Futreal, P.A., Pusztai, L. & Swanton, C. Intratumor heterogeneity: seeing the wood for the trees. Sci. Transl. Med. 4, 127ps10 (2012). 13. Aldridge, B.B., Burke, J.M., Lauffenburger, D.A. & Sorger, P.K. Physicochemical modelling of cell signalling pathways. Nat. Cell Biol. 8, 1195–1203 (2006). 14. Huang, C.Y. & Ferrell, J.E. Jr. Ultrasensitivity in the mitogen-activated protein kinase cascade. Proc. Natl. Acad. Sci. U.S.A. 93, 10078–10083 (1996). 15. Bhalla, U.S. & Iyengar, R. Emergent properties of networks of biological signaling pathways. Science 283, 381–387 (1999). 16. Schoeberl, B. et al. Therapeutically targeting ErbB3: a key node in ligand-induced activation of the ErbB receptor-PI3K axis. Sci. Signal. 2, ra31 (2009). 17. McDonagh, C.F. et al. Antitumor activity of a novel bispecific antibody that targets the ErbB2/ErbB3 oncogenic unit and inhibits heregulin-induced activation of ErbB3. Mol. Cancer Ther. 11, 582–593 (2012). 18. Fitzgerald, J. & Lugovskoy, A. Rational engineering of antibody therapeutics targeting multiple oncogene pathways. MAbs 3, 299–309 (2011). 19. Harms, B.D., Kearns, J.D., Su, S.V., Kohli, N., Nielsen, U.B. & Schoeberl, B. Optimizing properties of antireceptor antibodies using kinetic computational models and experiments. Meth. Enzymol. 502, 67–87 (2012). 20. Kirouac, D.C., Saez-Rodriguez, J., Swantek, J., Burke, J.M., Lauffenburger, D.A. & Sorger, P.K. Creating and analyzing pathway and protein interaction compendia for modelling signal transduction networks. BMC Syst. Biol. 6, 29 (2012). 21. Morris, M.K., Saez-Rodriguez, J., Sorger, P.K. & Lauffenburger, D.A. Logic-based models for the analysis of cell signaling networks. Biochemistry 49, 3216–3224 (2010). 22. Morris, M.K., Saez-Rodriguez, J., Clarke, D.C., Sorger, P.K. & Lauffenburger, D.A. Training signaling pathway maps to biochemical data with constrained fuzzy logic: quantitative analysis of liver cell responses to inflammatory stimuli. PLoS Comput. Biol. 7, e1001099 (2011). 23. Wittmann, D.M., Krumsiek, J., Saez-Rodriguez, J., Lauffenburger, D.A., Klamt, S. & Theis, F.J. Transforming Boolean models to continuous models: methodology and application to T-cell receptor signaling. BMC Syst. Biol. 3, 98 (2009). 24. Hartwell, L.H., Hopfield, J.J., Leibler, S. & Murray, A.W. From molecular to modular cell biology. Nature 402, C47–C52 (1999). 25. The Cancer Genome Atlas. Comprehensive genomic characterization defines human glioblastoma genes and core pathways. Nature 455, 1061–1068 (2008). 26. TCGA Network et al. Comprehensive genomic characterization of squamous cell lung cancers. Nature 489, 519–525 (2012). 27. Stephens, P.J. et al. ; Oslo Breast Cancer Consortium (OSBREAC). The landscape of cancer genes and mutational processes in breast cancer. Nature 486, 400–404 (2012). 28. Segal, E., Friedman, N., Koller, D. & Regev, A. A module map showing conditional activity of expression modules in cancer. Nat. Genet. 36, 1090–1098 (2004). 29. Liu, Y.Y., Slotine, J.J. & Barabási, A.L. Observability of complex systems. Proc. Natl. Acad. Sci. U.S.A. 110, 2460–2465 (2013). 30. Snuderl, M. et al. Mosaic amplification of multiple receptor tyrosine kinase genes in glioblastoma. Cancer Cell 20, 810–817 (2011). 31. Wilson, T.R. et al. Widespread potential for growth-factor-driven resistance to anticancer kinase inhibitors. Nature 487, 505–509 (2012). 32. Sos, M.L. et al. Identifying genotype-dependent efficacy of single and combined PI3K- and MAPK-pathway inhibition in cancer. Proc. Natl. Acad. Sci. U.S.A. 106, 18351–18356 (2009). 33. Cirit, M., Wang, C.C. & Haugh, J.M. Systematic quantification of negative feedback mechanisms in the extracellular signal-regulated kinase (ERK) signaling network. J. Biol. Chem. 285, 36736–36744 (2010). 34. Chandarlapaty, S. et al. AKT inhibition relieves feedback suppression of receptor tyrosine kinase expression and activity. Cancer Cell 19, 58–71 (2011). 35. Duncan, J.S. et al. Dynamic reprogramming of the kinome in response to targeted MEK inhibition in triple-negative breast cancer. Cell 149, 307–321 (2012). 36. Nik-Zainal, S. et al. ; Breast Cancer Working Group of the International Cancer Genome Consortium. The life history of 21 breast cancers. Cell 149, 994–1007 (2012). 37. Landau, D.A. et al. Evolution and impact of subclonal mutations in chronic lymphocytic leukemia. Cell 152, 714–726 (2013). 38. Irish, J.M. et al. Single cell profiling of potentiated phospho-protein networks in cancer cells. Cell 118, 217–228 (2004). 39. Cohen, A.A. et al. Dynamic proteomics of individual cancer cells in response to a drug. Science 322, 1511–1516 (2008). 40. Diaz, L.A. Jr et al. The molecular evolution of acquired resistance to targeted EGFR blockade in colorectal cancers. Nature 486, 537–540 (2012). 41. Miller-Jensen, K., Janes, K.A., Brugge, J.S. & Lauffenburger, D.A. Common effector processing mediates cell-specific responses to stimuli. Nature 448, 604–608 (2007). 42. Lee, M.J. et al. Sequential application of anticancer drugs enhances cell death by rewiring apoptotic signaling networks. Cell 149, 780–794 (2012). 43. Mould, D.R. & Upton, R.N. Basic concepts in population modeling, simulation, and modelbased drug development. CPT: Pharma. Syst. Pharmacol. 1, e6 (2012). 44. Claret, L. et al. Model-based prediction of phase III overall survival in colorectal cancer on the basis of phase II tumor dynamics. J. Clin. Oncol. 27, 4103–4108 (2009). 45. Wang, Y. et al. Elucidation of relationship between tumor size and survival in non-smallcell lung cancer patients can aid early decision making in clinical drug development. Clin. Pharmacol. Ther. 86, 167–174 (2009). 46. Gaudet, S., Spencer, S.L., Chen, W.W. & Sorger, P.K. Exploring the contextual sensitivity of factors that determine cell-to-cell variability in receptor-mediated apoptosis. PLoS Comput. Biol. 8, e1002482 (2012). 47. Kauffman, S.A. Metabolic stability and epigenesis in randomly constructed genetic nets. J. Theor. Biol. 22, 437–467 (1969). 48. Saez-Rodriguez, J., Alexopoulos, L.G. & Stolovitzky, G. Setting the standards for signal transduction research. Sci. Signal. 4, pe10 (2011). 49. Janes, K.A. & Yaffe, M.B. Data-driven modelling of signal-transduction networks. Nat. Rev. Mol. Cell Biol. 7, 820–828 (2006). 50. Kirouac, D. et al. Computational modeling of ERBB2-amplified breast cancer identifies combined ErbB2/3 blockade as superior to the combination of MEK and AKT inhibitors. Sci. Signal. 6, ra68 (2013). 51. Wong, H. et al. Bridging the gap between preclinical and clinical studies using pharmacokinetic-pharmacodynamic modeling: an analysis of GDC-0973, a MEK inhibitor. Clin. Cancer Res. 18, 3090–3099 (2012). 52. Harrold, J.M., Straubinger, R.M. & Mager, D.E. Combinatorial chemotherapeutic efficacy in non-Hodgkin lymphoma can be predicted by a signaling model of CD20 pharmacodynamics. Cancer Res. 72, 1632–1641 (2012). 53. Wang, S., Guo, P., Wang, X., Zhou, Q. & Gallo, J.M. Preclinical pharmacokinetic/ pharmacodynamic models of gefitinib and the design of equivalent dosing regimens in EGFR wild-type and mutant tumor models. Mol. Cancer Ther. 7, 407–417 (2008). 54. McMillin, D.W., Negri, J.M. & Mitsiades, C.S. The role of tumour-stromal interactions in modifying drug response: challenges and opportunities. Nat. Rev. Drug Discov. 12, 217–228 (2013). 55. Kirouac, D.C., Madlambayan, G.J., Yu, M., Sykes, E.A., Ito, C. & Zandstra, P.W. Cell-cell interaction networks regulate blood stem and progenitor cell fate. Mol. Syst. Biol. 5, 293 (2009). 56. Kirouac, D.C. et al. Dynamic interaction networks in a hierarchically organized tissue. Mol. Syst. Biol. 6, 417 (2010). 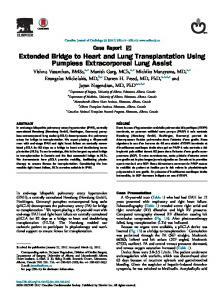 Report "Using Network Biology to Bridge Pharmacokinetics and ... - ASCPT"